Despite all the recent rain and clouds, and, the local forecast for the possibility of rain last night, Clear Sky Chart predicted clear skies for about 5 hours after sundown. I decided to give it a try. Although the humidity was high (water dripping from the awning) and the moon was at 33%, the weather was beautifully clear and crisp at 42F. The focus and guiding were both a bit better last night than on the previous outing last week. The data from last night was combined with the previous data to create this image. I have tried to use a "softer touch" this time. I'm still learning how to process data taken with this Triad filter. The bad guiding on the first night has left me with brighter stars that are "squarish". Also, the star colors are a bit blueish to me, but, c'est la vie. KathyNS, dmdmtr, jaetea and 15 others like this. Steve, I like it....a lot. Very very nice Steve, the additional data shows in the smoothness of the image. Beauty! good work. definitely better than the previous version. Thanks Jerry - I'm very happy to be able to create such an image of this dim target. Thanks Bill - This was about the third processing approach, and, the light blue in the helmet finally emerged on it's own. Processing data taken with this new filter has been a learning experience. However, the improved SNR has been worth the effort. Thanks "G" - I was happy to see the improvement the added data provided. Thanks geethq - I was happy to achieve better focus and guiding on the second night. It definitely contributed to the improved image. Thanks Marius for the nice words. The original was very nice and I like this version even better. Very nice capture Steve, love the colors! Wow. That really stands out now. Great job. I wonder if you can make a false luminance with this data and combine it with your RGB from before? Just a thought. Well done. 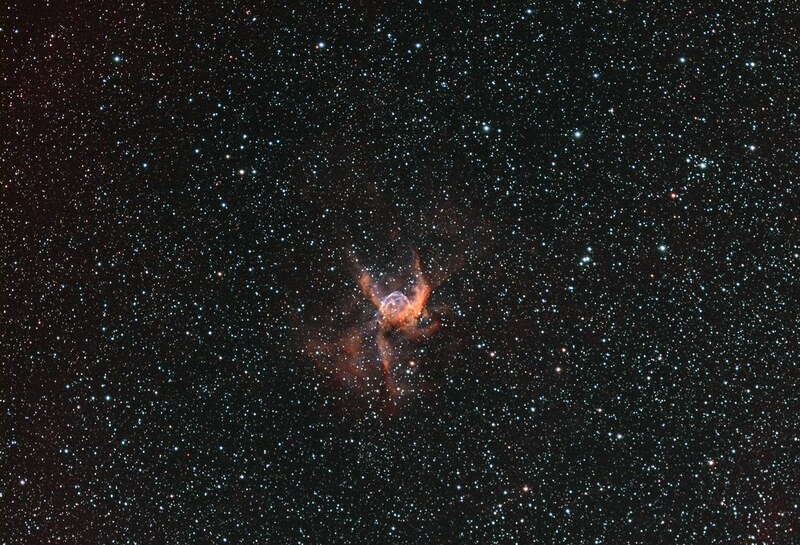 Thor's Helmet (NGC 2359) in time for the Super Bowl?